Movie Review: “Turbo Kid” is an expeditiously diverting Canadian actioner that rekindles the adventurous spirit of “Indiana Jones”, the post-apocalyptic eccentricity of “Mad Max”, and the gory feast of Japanese action flicks. It’s undoubtedly a film of excesses, however, its vigorous pace, tasteful imagery and score evoking the 80’s, a diversity of props that enrich the rambunctious atmosphere, and finally, a throbbing, creative script that has much amusement to offer, provides a wonderful time punctuated with a few good laughs to the viewers who dare to embark on this insanely radical fun ride. The story takes place in futuristic 1997 in a wrecked uncertain place known as the Wasteland. The Kid (Munro Chambers), protected by his helmet and a couple of vital survival rules, rides his bike, scavenging old stuff, now seen as precious, that he trades afterwards for a minimal portion of water. At the bar where the trader can be found, he admires Frederic (Aaron Jeffery), a sharp-tongued arm-wrestling champion whose brother disappeared after being captured by the sanguinary savages of Zeus (Michael Ironside), a loathsome one-eyed ruler who affirms he has ‘eyes’ everywhere and takes his time inventing abominable ways of torturing people. In the meantime, in one of his scavenges, the Kid bumps into the apparently effusive Apple (Laurence Leboeuf), a pink-haired teenager who was speaking to the cadaver of a friend and almost forces the Kid to accept her as a daily companion. A genuinely sweet romance starts to take shape, but during the desperate attempt of escaping from one of the Zeus’ vassals, Apple is captured while the Kid is granted with a special superpower when engulfed by a hidden trapdoor. At this point, the Kid fearlessly saves Apple, who unveils a secret of her own, and together they team with Frederic in the battle against the evil. 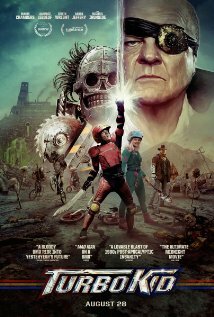 Kids should stay away from “Turbo Kid”, an enthralling adventure for adults that sometimes feels disgusting and yet effectively ingenious. The newcomer trio of writers/directors known as RKSS Collective, despite the blood overdose, did an exceptional job.